Ansonia Clock Co., Royal Bonn, "LaNord", ca 1904. 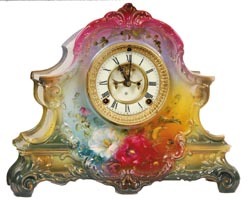 This is a multi colored clock, there are reds, yellows, blues, and greens, of various shades, plus white flowers, as well as the other shades mentioned. Gold highlights were used sparingly on this case, but enough to blend with the many other colors. Only Ansonia could mix the various colors so well. The case is 11.75" high, 14.5" wide. Ly-Ansonia, page 607.